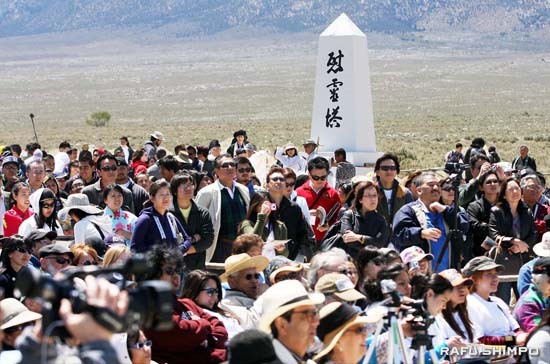 The 43rd annual Manzanar Pilgrimage, sponsored by the Los Angeles-based Manzanar Committee, is scheduled for 12 p.m. on Saturday, April 28, at the Manzanar National Historic Site, located on U.S. Highway 395 in California’s Owens Valley, between the towns of Lone Pine and Independence, approximately 230 miles north of Los Angeles. Each year, over 1,000 people from diverse backgrounds, including students, teachers, community members, clergy and former incarcerates, attend the pilgrimage, which commemorates the unjust incarceration of over 110,000 Americans of Japanese ancestry in ten American concentration camps, which were located in the nation’s most desolate, isolated regions. Manzanar was the first of these camps to be established. This year, the pilgrimage will commemorate the 70th anniversary of President Franklin D. Roosevelt’s signing of Executive Order 9066 on Feb. 19, 1942, authorizing the mass roundup of West Coast Japanese Americans during World War II. The event will also commemorate the 20th anniversary of the establishment of the Manzanar National Historic Site, which was authorized by legislation signed by President George H.W. Bush on March 3, 1992. The afternoon program, held at the Manzanar cemetery site, will begin with a performance by UCLA Kyodo Taiko, the first collegiate taiko group in North America. The afternoon program will conclude with the traditional interfaith service and traditional onto dancing. In addition to the daytime program, the popular Manzanar At Dusk (MAD) program follows that same evening, from 5 to 8 p.m., at the Lone Pine High School gymnasium, located at 538 S. Main St. (U.S. Highway 395) in Lone Pine, nine miles south of the Manzanar National Historic Site, across the street from McDonald’s. MAD is co-sponsored by the Lone Pine Unified School District, Lone Pine High School, Cal Poly Pomona Nikkei Student Union, UCLA Nikkei Student Union, and UC San Diego Nikkei Student Union. Through a creative presentation, small group discussions and an open mic session, MAD participants will have the opportunity to learn about the experiences of those incarcerated in the camps. Participants will also be able to interact with former incarcerees in attendance to hear their personal stories, to share their own experiences, and discuss the relevance of the concentration camp experience to present-day events and issues. An air-conditioned bus will depart from St. Francis Xavier Chapel Japanese Catholic Center (formerly the Maryknoll Japanese Catholic Center), 222 S. Hewitt St., at 7 p.m. on April 28. They will arrive at the Manzanar National Historic Site at approximately 11:30 a.m. The bus will take participants to the Interpretive Center at the Manzanar National Historic Site following the afternoon program. The bus should arrive back in Los Angeles at approximately 8:30 p.m. Bus reservations are now being accepted on a first-come, first-served basis. For further information or to make a reservation, call (323) 662-5102, or send email to [email protected] The non-refundable fare is $40 per seat. Those wishing to participate in Manzanar At Dusk should make other transportation arrangements. Both the daytime program and Manzanar At Dusk are free and open to the public.